This was critical for those of us glorying in what's getting called "peak TV." In movies, it's the director whose vision is executed, who controls the tone and pace. But in television, plots, characters, themes, even the vibe, all get established in the writers room. Back in 2015, Shonda Rhimes, arguably the most powerful woman in television, described herself as first a writer in an interview on WHYY's Fresh Air. "On Grey's Anatomy and Scandal, I am the writer, executive producer, creator. On How To Get Away With Murder, I am just the executive producer." "It's more like being the grandmother," she said. "You hold the baby but then you get to give the baby back. With the other shows, I'm responsible for everything." "Writers literally run TV shows," agrees James Poniewozik, chief TV critic for The New York Times. He says "peak TV" — an era where more than 450 scripted series were produced this season alone — would be impossible without hundreds of writers rooms filled with people bouncing ideas off each other, polishing each others' work — and serving the creator's singular voice. The collective voice of the writers room is especially crucial with a network comedy like ABC's Black-ish that might produce as many as 25 episodes a season. But shorter series are increasingly common on streaming, cable and even network shows. Stranger Things, on Netflix, had only eight episodes. That translates to less money for writers, who are paid per episode. According to the Writers Guild of America, writers' median salaries have actually dropped over the past two years. Poniewozik was hopeful this strike would be averted. As happy as he is that the writers and studios have found common ground, he could not help but think about a strike's potential personal upside. While Los Angeles is breathing a sigh of relief — the city lost more than a billion dollars during the last writer's strike in 2007 — viewers like Poniewozik will have to figure out how stay on top of all the TV shows its writers dream up for us. 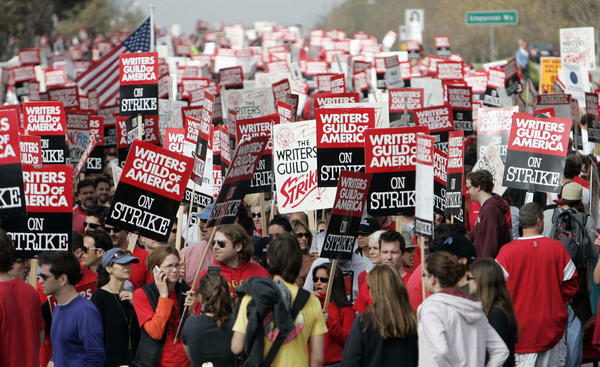 The biggest drama here in Hollywood right now is whether the Writers Guild of America will go on strike. The union represents about 13,000 film and TV writers. And they voted to strike if no contract settlement is reached by midnight tonight. Last time writers went on strike in 2007, it stopped a lot of film and TV production for four months. NPR's Neda Ulaby explains that writers occupy a uniquely important position in TV. NEDA ULABY, BYLINE: Movies are all about the director, vision, tone, pace, control. You're watching the story through the eye, mind and heart of the director. In television though, plots, characters, themes, vibe all get established in the writers' room. SAMANTHA SLOYAN: (As Dr. Penelope Blake) She can't talk. JESSE WILLIAMS: (As Dr. Jackson Avery) And I'm her surgeon now, right? You can't come in here and just take out her wire. SLOYAN: (As Dr. Penelope Blake) She is my patient. I know what I am doing. You can rewire her jaw tomorrow morning, but right now she needed some air, so I got her some damn air. ULABY: A few years ago, arguably the most powerful woman in television, Shonda Rhimes, described herself in an interview on WHYY's Fresh Air. SHONDA RHIMES: On "Grey's Anatomy" and "Scandal" I am the writer, executive producer, creator. On "How To Get Away With Murder," I'm just the executive producer. ULABY: Just the executive producer. And note she said writer first. Rhimes told the host, Terry Gross, that being the executive producer in charge of "How To Get Away With Murder" involves far less creative control. RHIMES: It's more like being the grandmother. You hold the baby, but then you get to give the baby back, whereas the other shows I'm responsible for everything. JAMES PONIEWOZIK: Writers literally run TV shows. ULABY: That's James Poniewozik, TV critic for The New York Times. He says this era of peak TV, with more than 450 scripted series this season alone, would be impossible without hundreds of writers' rooms filled with people bouncing ideas off each other, polishing each other's work and serving the creator's singular voice. PONIEWOZIK: "Mad Men" was a particular example of that. It was a show really that was TV, but it was very literary. It sort of modeled itself on, you know, the kind of voice that you would have in short fiction. JON HAMM: (As Don Draper) This is the greatest advertising opportunity since the invention of cereal. We have six identical companies making six identical products. We can say anything we want. ULABY: The collective voice of the writers' room became especially crucial with a network comedy like "Blackish" that might produce as many as 25 episodes a season. But right now on streaming cable and even network shows, we're seeing lots and lots of shorter series. For example, "Stranger Things" on Netflix had only eight episodes. Because writers get paid per episode, a shorter series translates to much less money. And according to the Writers Guild of America, writers' median salaries have actually dropped over the past two years. Most of them make far less than a juggernaut like Shonda Rhimes. Critic James Poniewozik sympathizes with everybody in the TV industry who might be affected by a strike, but he can't help but point out a potential personal upside. PONIEWOZIK: I might at least get caught up on a lot of my backlog. ULABY: All those shows we don't have time to watch might be ones we can finally get around to. Poniewozik plans to check out the Showtime drama "Billions." And if, God forbid, the strike drags on and on, he points out there are at least four decades worth of the show "Dr. Who." (SOUNDBITE OF BBC RADIOPHONIC WORKSHOP AND EVOLUTION'S "DR. WHO - MAIN TITLE" Transcript provided by NPR, Copyright NPR.